Sills, and structural rust repaired and repainted by Daytona Coachworkx in 2015 (£1,018.91 excl VAT). This work also included repainting the side bump strips and front light surrounds. Most of the major mechanical work has been carried out by Porsche specialist Porshacare Ltd. All receipts available. 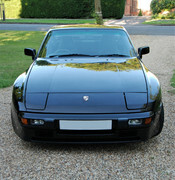 Matt at Porschacare considers this to be a well sorted 944 LUX. Feel free to call him and get his opinion direct (mobile 07572 555 076). This car has been my rolling restoration project for the past 4 years and I have concentrated on bringing the car up to full mechanical health. The car starts on the button, emits no blue smoke, and runs really smoothly. The refreshed and enhanced ignition, engine management/performance improvements, and rebuilt gearbox and LSD mean that you will be unlikely to find a better running and driving 944 Lux, and as a 1985.5 car it has the lightness and agile narrow track of an early 944, with the improved interior of the later cars. The car is reliable in hot and cold starts. The major mechanical jobs have been done on this car. The only job in the foreseeable future are that the belts and rollers will need to be done in Jan 2020 as advised by Porsche (3 year intervals). I have removed the fog lights from the front valance as they were corroded and I wanted to replace the front valance with a non foglight version (OEM used part sourced and included in the sale – worth £120). OEM Hella foglights are still available to buy new and are simple to fit. All wiring and interior switches still in place. I have had the above work required quoted for and it would amount to approximately £1,500 plus VAT. The price reflects this, as with this done it would be the one of the best spec'd, best condition, and best driving 2.5 litre 944 Lux in the country. I have redacted the number plate from the ad photos to avoid fraud. I am looking to retain the current number plate on the car which is non-original. The car will be re-registered with the UK C-reg plate. As a point of interest the car was originally delivered to a dealership in Hong Kong in 1985 and must have been brought to England when Hong Kong was returned to China. It was a rare highly spec’d car at the time before the Turbo was released. Contact Duncan on 07711636285 or pm me for more details. The car is in North Hertfordshire. Proof of insurance required before test drive.